Uganda's Welter Weight boxer, Fred Muhumuza improved his impressive professional record to 6 straight victories, 4 Knock-outs and 2 wins on points decision after beating Kenyan Patrick Amote in the welter weight category in a 10 round fight played at Club Obligatto in Kampala during the wee hours of Friday night. "I believe i deserved this victory, i put in extra hours of road work and sparring. This victory is clear manifestation of my toil", a happy Muhumuza, an orthodox boxer told the relatively big turn up in his victory acknowledgement speech. On a very busy night of boxing bouts in Kampala, another Ugandan Hudson Muhumuza, fighting in the Heavy weight also at Obligatto won the heavy weight under card fight over yet another Kenyan, James Ololo with a technical knock-out in the very first round of the scheduled 6 round fight. 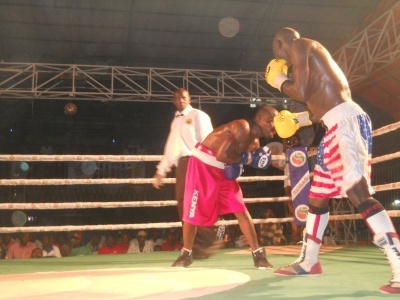 The fights at Obligatto also included an 8th round win for Sula Segawa over Congo Brazzaville's Herve Zongo .They were organized by Big Strikers international with the blessing of Uganda Boxing Union. Across the other side of Kampala, charity bouts organized by Inter-Sport and Uganda Professional Boxing Commission at Hilton Hotel, Nakasero saw the return of Badru 'Mr Crush' Lusambya after a 2 year's sabbatical leave. He indeed proved to be the true crusher and he flowed Tanzanian Zombe Kukwe in the 2 round with a K.O. The main fight at Hilton saw Irish man, Kenny Egan, who is also the 2008 silver medalist at the olympic games in the light weight defeat home boy, Musa Batantu on points. All the 3 judges concurred that Egan won 39-33, 44-34 and 49-35. Hard Fighting Zebra 'Mando' Ssenyange, fresh from fighting another fight 6 days ago at DB 9 pub over Jinja based Ssabasaba, yet again beat Ibrahim Zziwa in just 1 minute and 27 Seconds of the opening round. Aspirations: In a 2 Years’ time lag, he hopes to hit the African and World Titles.